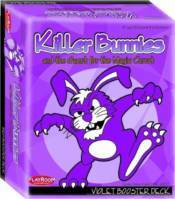 Blast off with a new Bunnies Booster Deck that definitely contains The White Stuff! The Twilight White Booster Deck adds 55 cards to your existing set, 2 more Pawns, and a White twelve-sided die! Other fantastic cards include: Calcite Conundrum which doubles the amount of cards you play each turn, Blue Angels to defend against airborne dangers, Melding which forces you to exchange cards, Return to Sender which can save your bunnies from dastardly fates, and new 50/50 weapons where your only defense is your feel for the dice! Use your mental powers to survive Psychic Waves or team up against an opponent's bunny by using Mob Hit. Whatever you do, avoid the Dueling Grandmothers at all costs! This Booster Deck is tight, it's White, and it's got some bite!